How Did We Descend to Infanticide? Did you see the movie “Titanic,” the 1997 original or the subsequent 3D version? Then you saw an extremely educational scene. After the ship hit the iceberg, the captain called the officers and the ship’s designer, Thomas Andrews, to the bridge. The owners’ representative voiced his opinion that the ship was unsinkable. Andrews explained that the front watertight compartments had been opened to the sea in the collision. But as the bow of the ship sank lower, water would pour over the top of the bulkhead into the next compartment, and then the next, until the ship sank. It is insufficient merely to be correct. In order to succeed, we must be correct in time to do any good. 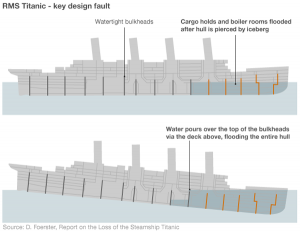 The sinking of the Titanic was an event that had significance far beyond the actual tragedy. People learned that modern technology was no guarantee of progress, or even of survival. People learned that being “modern” was no guarantee of being happy, or even being alive. But we seem to have forgotten those costly lessons. ● First we legalized abortion of early fetuses. ● Then we legalized abortion of late-term fetuses, even healthy, viable ones. ● Then we legalized partial-birth abortion, in which the brain is destroyed as the baby emerges from the birth canal. ● Then we twice elected Barack Obama to be our president, despite the fact that as an Illinois state senator, he three times voted against a “born alive” law that would have required medical care for babies born after “failed” abortions. ● Now the U.S. Congress failed to pass a “born alive” bill after Democrats blocked it. ● Now Pennsylvania failed to pass a similar “born alive” bill. ● Now New York passed a law, to the cheers of the delegates and the approval of Gov. Cuomo, that allows abortion up to the moment of birth, and that specifically rejects requiring medical personnel to give care for infants born alive after “failed” abortions. Yes, the legislators passed the bill, but did they have to cheer, as if they had won a sporting event? ● But who is next? Young people with autism? Old people with dementia? Homeless people with mental illness? Who knows? But we do know that there will be a next. You didn’t imagine it would stop here, did you? “Movements” are never goal-oriented; they are power-oriented. Whether it is gun control, or speech control in universities, or environmentalist control of everyday life, or getting rid of the unwanted ‒ whatever it is ‒ it is always “a good first step.” Note how often big-government activists use that expression. There is always the next step. There is always the next compartment to be flooded. It is incorrect to say that America now supports infanticide. No, not America, but our cultural and political “leaders.” They are so afraid of doing anything that might be perceived as pro-life, or insufficiently pro-abortion, or inadequately pro-choice, that they are utterly unafraid of being associated with the practice of infanticide. We are all afraid of something. What we are afraid of tells a lot about us. Some people are afraid of killing the innocent and facing a just God. Other people are afraid of being politically incorrect and facing angry leftists. Is it not hyperbole to say that our “leaders” are willing to condone child sacrifice to their false gods of political correctness, progressivism, and modernity, for fear of being declared heretics by their intolerant leftist backers. And then we come to assisted suicide and euthanasia of the severely disabled, or the not-so-severely disabled. When brain-damaged Terri Schiavo was dehydrated and starved to death over 13 days, and neither the Florida Supreme Court nor the U.S. Supreme Court lifted a finger to save her, I believe that represented a sign post for our nation and our civilization. I believe the current slide toward infanticide represents another sign post along the road we are traveling. Will we heed the warnings, or continue on our downhill course? If all human life isn’t sacred and precious, none is. Then who lives and who dies becomes not a biologic event but a bureaucratic decision. And if the 20th century taught us anything, it was where that path leads. But did the 20th century teach us anything? Did we not see the smoke wafting from the chimney of the Nazi euthanasia clinic at Hadamar? Did we not understand that this was the prelude to the smoke billowing from the chimneys of Auschwitz? Or did the costliest lesson in history leave us ignorant and unaware? Naïveté is charming in young children. It is inappropriate and dangerous in adults, where it merges into gullibility and negligence. If all human life isn’t sacred and precious, none is. Intermediate positions are weak and are being overrun one by one. It is as if we were on the Titanic. The outer hull of the ship is strong, but the internal partitions, the bulkheads, are weak. Once the outer hull is breached, the cold, dark sea pours from one compartment into the next. And as the ship continues to sink, the rate of sinking grows ever faster. Then, at some point that can be recognized only in retrospect, the sinking becomes irreversible.